A multitalented beast of a knife, the Bushmaster Survival Bowie is tough, versatile and easy to wield - perfect for challenging wilderness adventures, everyday cutting jobs and everything in between. Its 7 1/2" clip point blade is forged from resilient 3Cr13 stainless steel, shrouded in a chic, nonreflective black finish. Ideal for hacking and slicing, the blade's fine edge is carefully honed to razor sharp. Rugged sawtooth serrations on the blade spine make quick work of stubborn rope and cord fibers and even stout branches, small trees and other demanding materials. 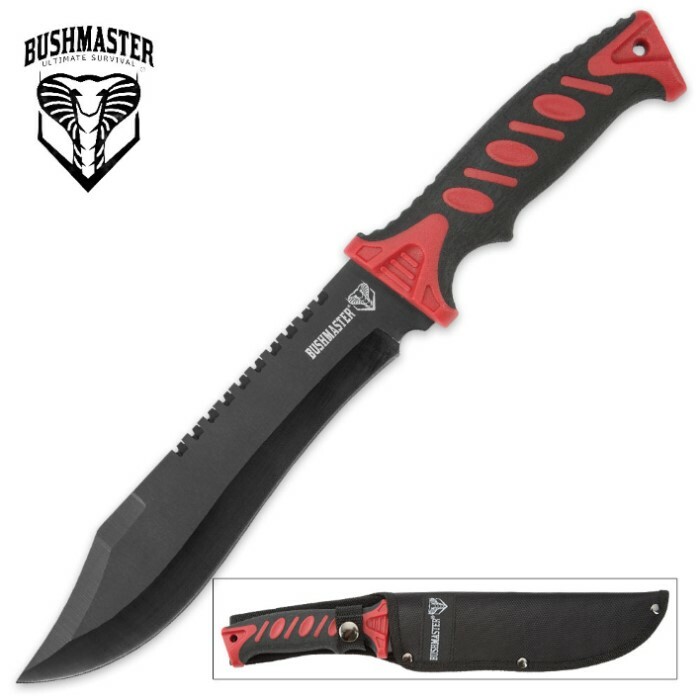 Through rigorous field work and harsh environmental conditions, Bushmaster's Survival Bowie is always a pleasure to wield, thanks to its impeccable balance and weight distribution and ergonomically molded handle. The no-slip rubberized grip forms a tenacious bond with your hand that sweat, moisture and grime won't break. The grip's delicate, hide-like texture yields a brandishing experience that's delightfully tactile and remarkably comfortable - even after long hours of tough hacking, slashing and cleaving jobs. Durable and easy to carry, the included nylon belt sheath capably protects the Bushmaster Survival Bowie through punishing terrain and brutal conditions. An integrated lanyard hole in the bowie's handle conveniently offers an additional transport and/or tethering option. 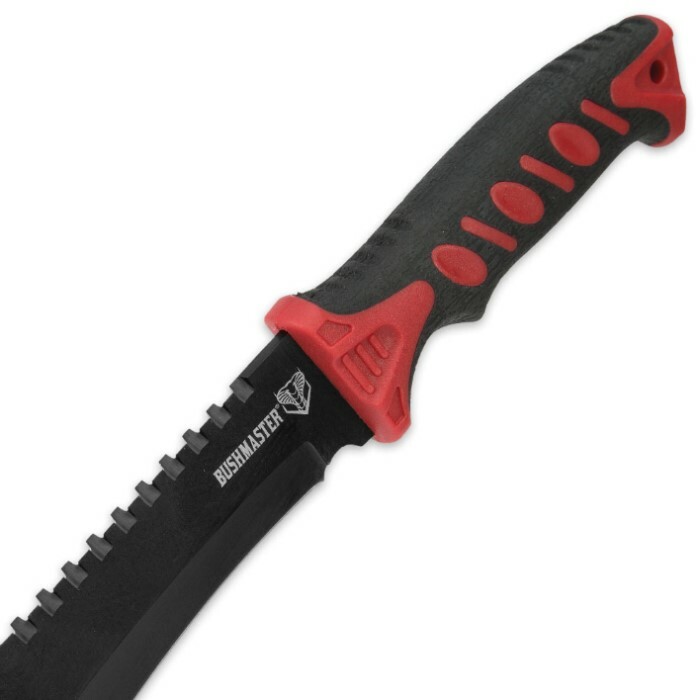 With so many extraordinary features packed into one phenomenal knife, it's abundantly clear - if you had to pick just one fixed blade knife to take on your next wilderness excursion, Bushmaster's Survival Bowie is the smart, obvious choice. Alright so i bought these in bulk and have 8 of them. So I decided "Eh, why not stress test it?" And wow. I smashed it into trees, sideways into nails. Used it as a hammer on a rock. About 15 minutes in it started rattling and I thought "Almost there!" But it's an hour later and I'm too tired to try and break it anymore! Beating the edge against nails is the only way I found to dull it! I even sank the ENTIRE blade into a stump and leaned my 6 foot frame against it to try and snap it. The stump lost and the blade only has a slight curve in it. For 15$? Can't beat it. I'd pay more than that honestly. This knife is ok for the price. 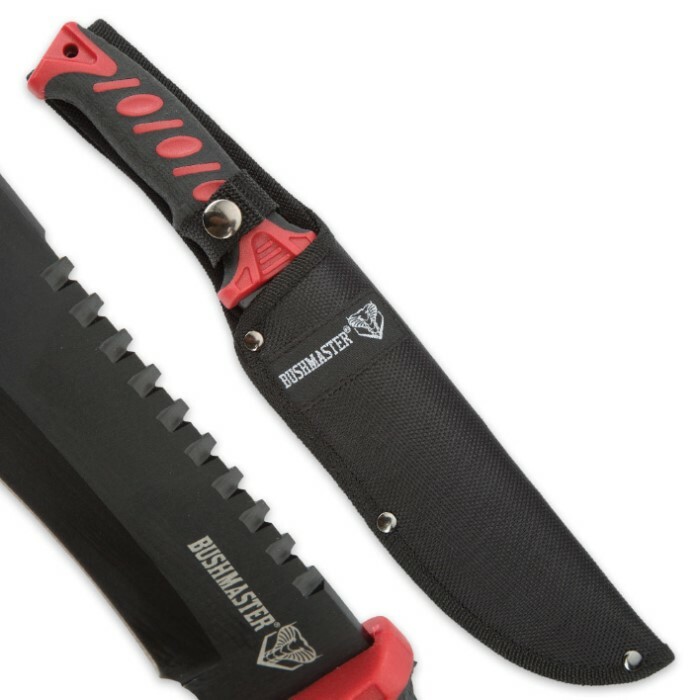 Would not call it a survival knife by any means. Dulls very easy, only has about a 1in tang with only one small plastic pin holding the knife to the handle. Handle came lose on the very first chop test. Get the $19.99 version with the plastic sheath. the blade is twice as think, better handle and no plastic pins. This is my favorite knife.. The rubber grip on the handle makes if feel really comfortable in your hands. The blade is very sharp. The sloped curvature of the blade helps with cutting as well, no need to push down when cutting, just pull strait back. Best part is that it's not the end of the world if anything happens to it... Just get another one.. I love this knife. The blade is sharp. The handle feels great in my hand. Perfect knife. Thanks BudK!